This morning, my project suddenly became real when three supervisors from Pinemere Camp arrived at Camp Moshava, where they spent the entire day! Moshava, a B'nei Akiva Modern Orthodox camp in Honesdale, is much larger than Pinemere, and bills itself as "an adventure in religious Zionism." Pinemere is a small overnight camp affiliated with the JCCA, but the visitors rapidly discovered that there was a lot they could learn there, as they toured the camp, sat in on activities, and met with key staff members from many different departments. The visitors discuss programming with Rachel Levitt-Klein, Moshava's drama specialist. Personally, I was impressed with several elements of Moshava's program. Their shlichim (Israeli staff members) number in the hundreds, and they work in every camp department, including the kitchen. As a Zionist camp, Moshava actively integrates its shlichim into the basic fabric of camp. The biggest surprise came at Moshava's beit midrash - in addition to serving as a place for the community to come and learn, the camp actually pays staff members (10 men and 10 women) to study there for the entire summer, and share that learning with the rest of camp. 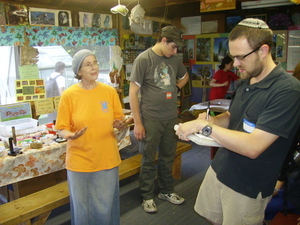 Noah, Pinemere's Jewish Program Supervisor, learn about Moshava's nature room. But I most appreciated Moshava's endless commitment to the quality of its programs. The nature room was fully stocked with guinea pigs, frogs, fish, and even a snake, not to mention the goats and ducklings outside. The science specialist eagerly showed us her demonstration of the science of light, featuring a wall of photosensitive phosphorous paper, ultraviolet gaga, and even a pyrotechnic display using hand sanitizer and coffee creamer. (I should probably say not to try the fire thing at home, but it was just so cool!!) Elsewhere, Moshava outfitted an entire building with an innovative, fully experiential museum-style exhibit demonstrating the Independence Hall/Israeli Declaration of Independence experience for campers, and continuing (over the course of several rooms, and using story cards and interactive activities) through the evolution of Israel's current society. All of the materials were designed in-house, at significant expense, but Moshava was willing to pay for a superior, engaging educational experience. In fact, throughout camp, Moshava spent big money on high quality programs and equipment. The Israeli history program (part of a rotating curriculum that changes every year) featured music, lighting, multiple ceiling-height printed panels, and even a flat-panel television, not to mention the custom-printed and laminated info cards. The science program required an entire garage to be darkened, and outfitted with new, expensive equipment. Elsewhere, the camp spent money to buy high-quality, effective sound and video systems, floating lake toys, and even a set of inflatable balls that fit campers inside. While many camps are reticent to spend money, Moshava recognizes that strong programs and specialty areas come from a commitment to invest sufficient money to "do it right," resulting in an exciting, high-quality experience for every child at every department. 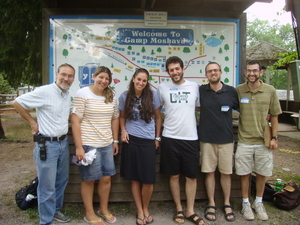 The surprise twist was the Moshava constantly evaluates its program, using computer surveys to measure camper satisfaction twice each summer, and asking staff members to participate in focus groups. It takes staff happiness very seriously, putting on nightly events for staff (with food! ), sponsoring frequent buses into town, and even hiring a director exclusively to be in charge of staff happiness. Most of the staff members with whom we met were genuinely enthusiastic about their areas, and (in the words of Halel, Pinemere's director of staff training) incredibly devoted. Their devotion has a clear impact on the success of Moshava's program, and it was unimaginably exciting to see that program on today's tour. Note: Special thanks to Chaim Livne of Moshava (and his helper Shoko) for putting together today's visit, to Toby Ayash of Pinemere for arranging for her wonderful supervisors to participate, and to everyone who helped make today's visit a success!